So, basically, you climb the mountain, pass the tests, and gain cosmic enlightenment! I like the idea of H'Catha, even if it's not enormously useful in play, unfortunately. It feels like a neat twist on the iconic idea of a voyage of enlightenment. In the alternate universe where Spelljammer got "splatbooks" I'd be interested in reading something that was a mix of the I, Tyrant material (which was informed by Spelljammer, but mostly focused on the usual groundling lone megalomaniac Beholder) and some of the spelljamemr references scattered among books. I feel like there might be multiple places like H'Catha that are varying degrees of 'neutral ground' for the beholder wars where they are less likely to kill each other and meet to escape the fighting (and probably scheme so two bloodlines with only small differences can exterminate a third before the inevitable betrayal). One question I've had about Realmspace is how much (if any) of the planets in the system had any real existence pre-Spelljammer. I assume some were at least mentioned: the moon of Toril, of nothing else. But are there any pre-Realmspace references to H'Catha as something observable from an observatory along the Sword Coast, for example? I'm quite fascinated by H'Catha and like almost Everything about it (as a concept - I'm probably not the best person to comment on usefulness in play, but I'd lean towards it having possibilities). Becoming Lawful Neutral as an automatic reaction for anybody who achieves universal knowledge without going mad is strange, though. Should all minds really react the same? (Apparently, as far as alignment goes.) Why Lawful Neutral, specifically? Does that mean that alignment officially "has it right"? And the idea that makes it feel it can work for me in the end, after all: We don't actually know that. Maybe there's nothing particularly right about LN, but it's still the alignment any mortal being with omniscience is pushed towards? Or maybe it's not even that, but the LN-ness is just a side-effect specific to the magic of the Spindle. Or what if it's the main, intended effect, and the omniscience is something else... bait? As far as I know, everything aside from the Sun, Selune and the Tears of Selune was invented whole cloth for Spelljammer, and had no existence prior to its publication. And even then those things were simply points of interest in the sky, with no mention of advanced civilizations lurking underneath a massive illusion. I kind of glossed over it, but the enlightenment is meant to be beholder-specific. That is, this process of enlightenment was devised by the original beholder gods in a long lost and forgotten sphere. And we're not talking about The Great Mother and Gzemnid, either. The enlightenment process was devised by gods so ancient and distant that no one alive aside from Large Luigi knows their name. However, it doesn't actually say that only beholders can achieve it. The only restriction placed on who can achieve enlightenment is the "brain must THIS big to ride this ride" sign just outside the entrance. Hence my suggestions of a grell, an intellect devourer, and Demogorgon. The text mentions that beholders who are thus enlightened (of which there is currently one in the known spheres) become information brokers, and this is part of their intended purpose. But they never ever reveal information that would tip the scales too far in the direction of good or evil. Anyhow, since the process was devised by ancient beholder gods to benefit beholders, one could certainly make the argument that only beholders are guaranteed to switch alignments to lawful neutral. Would a grell switch to LN? Would Demogorgon? The text is very broad, and it does state that any entity thus affected by the enlightenment would turn LN. But I suspect there's room for discussion there. Having finished off our look at all the actual planets in the system, the book moves on to a look at some additional points of interest in the system. The first is a total puff piece about the hideout and home-away-from-home of Toril's very own GM NPC. Elminster's Hideout is a metallic sphere about 250 feet across. It hovers in the lower atmosphere of Coliar, near the center of the planet, where Firebrand Firetongue the dragon resides. The exterior of the sphere is smooth, unblemished, and perfectly reflective. Rainbow patterns glint playfully off its shiny metal surface, and the whole business would not be out of place on a Yes album cover painted by Roger Dean. In addition to the visuals, Elminster's Hideout gives off a teeth-rattling, headache-inducing hum that gets more pronounced the closer one gets. No explanation is given as to what causes the hum, or why. Here now, the tale of how Elminster remains the GM NPC of the Realms: "Elminster invented the spell Elminster's evasion, to instantly teleport himself into this sphere, should any of several conditions occur. These qualifications are his death, loss of mental or physical faculties, destruction of both upper limbs or complete bodily volume, or upon his uttering the word 'Thaele.'" One wonders how he could be teleported anywhere upon the loss of "complete bodily volume". In any case, if Elminster is killed in any way, or even severely inconvenienced, he teleports here automatically and several other automatic magical spells inside the sphere work to bring him back to life or reconstitute his body, perhaps by adding a suitable amount of water. We are, naturally, given a brief tour of the place. The tour follows some text describing how difficult it is for anybody but Elminster to get in. And one presumes that anybody who did succeed would quickly be detected and detained, because Elminster is a crafty old goat who probably has spells thickly layered in this most private of spaces. There are, of course, shelves and shelves and shelves of books and potions and other magical gee-gaws and gimcracks. There is also a bed, a wardrobe, and a collection of Elminster's personal effects. Elminster also has (no joke, this is in the actual text) a Frigidaire window A/C unit mounted in the wall, because apparently it gets beastly hot inside the sphere otherwise. Under his bed are his original spellbooks, featuring ALL the spells he has learned and studied over the years. Realmspace was published shortly after the Time of Troubles in the Forgotten Realms, which would've made Elminster around 150 years old at the time. So that's a lot of spells in those books. They are, of course, very well protected with all manner of magical glyphs and wards. Also: "Under a shelf, hidden by several layers of rags and bloodied clothes, lies a chest which is locked with a magnificently crafted padlock. On the lid, engraved in a gold plate, the following words sparkle like cut diamonds: 'To my son, Lhaeo, with all my love and adoration. King Alemander IV.' (For more information regarding this, please see FR3 Empires of the Sands.)" Now I never read or played FR3 Empires of the Sands, so I have no idea what this is referring to. Anybody have any clue? Finally, there are four doors in the walls that lead to Elsewhere(tm). One door leads straight to the bedroom in his castle. A second door leads to Evermeet, because he's a GM NPC and therefore the only human allowed on the super secret island of the Elves. Not sure (and I hope someone with better Realms lore skills than myself will weigh in, but isn't Lhaeo Elminster's scribe/apprentice/manservant in some books? This suggests perhaps some sort of plot where Lhaeo's noble status is being ignored or even hidden while he serves as an apprentice. Or my brain's misfiring, which happens, too. Moving on from the mundane celestial bodies like planets and moons, we take a look at some of the more unusual and unique features of Realmspace. There's a very brief intro to this section which is most notable (and amusing) for the shade it throws in the direction of astrology. "Whether these astrological objects are really responsible for plagues and pivotal worldly happenings is a matter of debate. What people do not seem to realize is that coincidence and random chance are very strong forces in the universe." 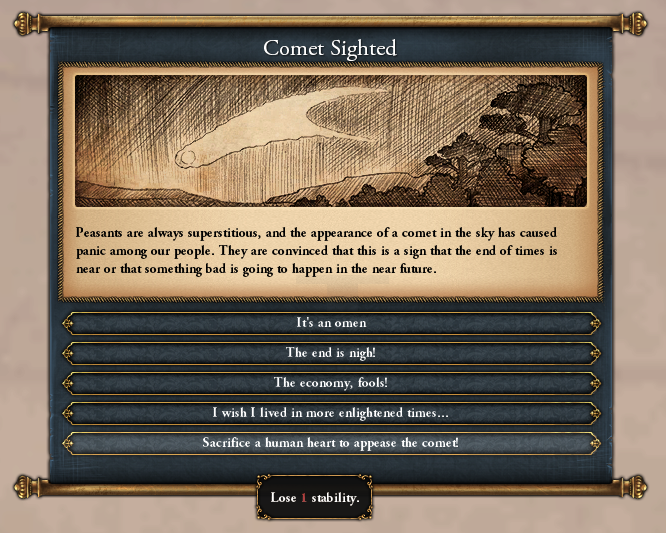 Comet K'Thoutek -- What's a quasi-medieval setting without a portentous harbinger of omen? Comet K'Thoutek is obviously a namecheck for Comet Kohoutek, but only takes 237 years to orbit the Sun of Realmspace (as opposed to the estimated 75,000 years it's gonna take before Kohoutek swings back around our Sun again). I find the phrasing odd, though. The text states "...taking over 237 years to make one complete trip around the Sun." And, like, that's a combination of vague and specific. When you use a phrase like "takes over N years", the implication there is that you're not bothering with precision, and simply providing a rough estimate. But then they turn around and pinpoint N to full accuracy. So why bother vague-ing it up with the lead-in? 1) They have large, delicious brains. 2) As a consequence of (1) above, all of the Oortlings on K'Thoutek were captured by mind flayers and taken to Glyth for livestock purposes. 3) There's an Oortling ghost left on K'Thoutek, and boy is he pissed. If an adventuring crew lands on the comet, one of 'em can expect to be possessed by the spirit of the Oortling ghost, who will then do everything within his power to make a beeline for Glyth and kill ALL the mind flayers. Or, more likely, die in the attempt. Or, more accurately, get his corporeal host killed in the attempt which won't affect him any but will likely cause acrimony and heartache for his corporeal host. He won't be hostile to the rest of the party unless they try to stop him. The comet is said to portend the birth of important and powerful figures on the world of Toril. The last time it showed up, the Simbul was born. The time before that, Elminster was born. So right there we have an upper bound to Elminster's age as 237 + however old the Simbul is. My guess is that if we cross-reference this information with Elminster's canonical birthday, they won't match up. Skull of the Void -- This is just what it says on the tin: A giant skull. Twelve miles (19 km) tall and ten miles (16 km) wide, looking like a human skull in every respect. It floats stationary at a point in space, very close (astronomically speaking) to the inner surface of the Realmspace crystal sphere. The Skull is the site of the most ambitious mind flayer livestock program to date: They're breeding beholders. The mind boggles at the thought of a Westminster Dog Show-esque affair, with illithids proudly running their beholders around the arena on a leash, judges looking for subtle defects in coloration or shape, blue ribbons handed out, big "Best of Show" trophies, and so on. Anyhow, the illithids keep the beholders harmless by snipping off their eyestalks before they can grow into dangerous weapons, and also blind the huge central eye by branding it. I reiterate my comments earlier in the thread about how the mind flayers really should be THE Big Bad of the setting. A few of the mind flayers here at the beholder ranch have developed the ability to levitate thanks to a steady diet of beholder brains. And in a miracle of Lamarckian evolution, they can now pass this ability on to their offspring. Caer Windlauer -- This is a beautiful Neuschwanstein-esque fairy tale castle, complete with thousands of acres of nearby grounds, floating serenely in space. The castle circles the sun in an eccentric orbit, but no orbital period is specified. "I, Omar McDauphin, master of this castle, and lord of all the surrounding acreage, hereby wish for complete and total isolation from the world, so that no one on Toril can again rob my possessions, frighten my family, or harm me again, forever." And, welp, he got it. He was transformed into a giant (so that nobody could harm him), all his possessions disappeared (can't steal 'em if they don't exist), his family was smuggled off to a cult of assassins where they were trained in the arts of death (so that nobody could frighten them, see? ), and his castle was blown into deep space (so nobody on Toril can hurt him). Wishes are more trouble than they're worth, really. Galleon Nebula -- This is a huge, misty region of wild magic, millions of miles across. It is literally shaped like a galleon, complete with oars that row back and forth as the nebula moves across the heavens. It's not visible from Toril with the naked eye, but apparently interested parties can see it with a telescope. Flying into the Galleon Nebula qualifies as a Bad Idea. It'll make the gravity plane go all wonky (Dex checks every round), it'll make ALL of the magical items a source of 1d4 damage every turn for any living creature within 20 feet (that's 1d4 per item, god help anybody locked in the armory or the treasure room), it'll clear the magnetic strip on the back of all your credit cards, it'll brick your phone, all kinds of bad news. Color Spray Nebula -- This nebula lies diametrically opposite the Galleon Nebula in the heavens of Realmspace. If you're looking at the Color Spray Nebula, the Galleon Nebula is RIGHT BEHIND YOU. This nebula looks like the results of the Color Spray spell -- a giant fan of rainbow colors. If you fly your ship into the nebula, everybody will get a little tingle. If any of the be-tingled folks has a disease of any kind, it gets cured. The catch is (there's always a catch, right? ): Each time you are be-tingled, there is a cumulative 1% chance that you will contract a very nasty and very fatal form of cancer. And, of course, the cancer can't be cured by the nebula that gave it to you. The nebula can cure any disease except this one. Final analysis: Not a lot of meat here, but still fun fluff. Man, the balls of the mind flayers, eh? I can already imagine an adventure where the PCs have to travel to H'Catha and survive the various beholder factions long enough to convince one or more of 'em that the mind flayers are breeding beholders for hors d'oeuvres. Of course, the most likely outcome would be that any beholders the PCs managed to convince would race to the Skull of the Void just to exterminate the results of the beholder breeding program. They'd be pissed at the illithids not because the illithids were harming beholders, but because the wily tentacle-faces were creating inferior beholders! Elminster was born in 212 DR, the Simbul in 766 DR. So ... yeah. Was Ed Greenwood a writer on this book? There's a "Space Castle" in his Lost Ships book, too... Just less interesting.